We were first alerted to the importance of belt cleaning by Roksan, who went to the most extraordinary lengths to clean the belt when setting up a new turntable for us several years ago. It may not be immediately obvious, but even a small variation in the friction between belt and drive pulley can cause a minute degree of slippage and hence speed variation in the platter. Bear in mind that target figures for wow and flutter are in the region of 0.02 per cent – that's one part in five thousand. Not much room for error there! The trouble is that many solvents attack rubber and the last thing you want to do when trying to clean a belt is to make it flake apart or crack up. 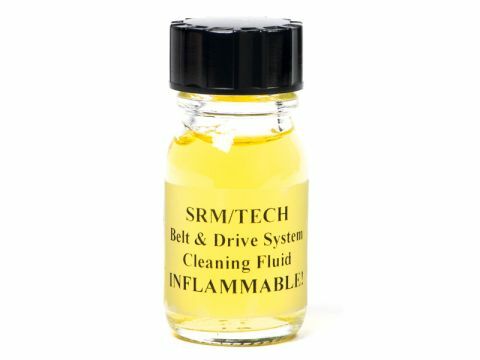 The contents of SRM-Tech's little bottle may be worth pennies, but the larger part of the price is for the peace of mind you get knowing that you've got something suitable for the job in front of you – and, of course, the convenience of having it in a small bottle with a few make-up removing pads and simple instructions on what to do with it all. We used this fluid on three turntables and in each case removed clearly visible amounts of deposits (household dust and minute flakes of worn rubber) from both the belt and, equally importantly, the pulley and subplatter. The results were clearly audible and indeed measurable, in one case lowering wow and flutter by a factor of more than two. The sound solidifies and snaps into focus in a way you could pay hundreds of pounds for if it were the whole turntable you were upgrading. Well worth doing every few months.